A small stream runs out of an older Kansas suburb and is channeled underground at the state line. A few blocks later it emerges in the median of a four lane parkway. Until recently it was completely overgrown with trees and brush. I had driven by it for twenty years and never new it had year round water. Over course my first thought was, "I've got to fish it". I went by early one morning and caught some green sunfish--they're everywhere. This week I went back to check for micros and catch some sunfish about sunset. 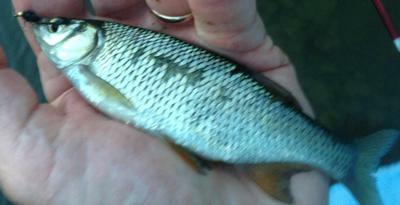 No targetable micros, but my first fish was this good sized golden shiner. Nothing like a good surprise. I later caught another one almost as large, and of course, lots of sunfish. 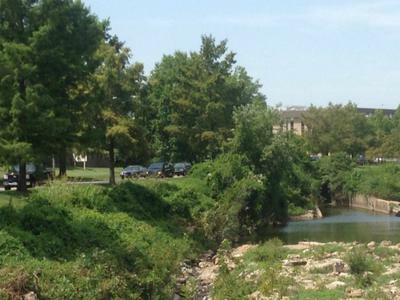 The creek has been dammed into some neighborhood ponds upstream. I assume these are bait fish that made it to freedom. 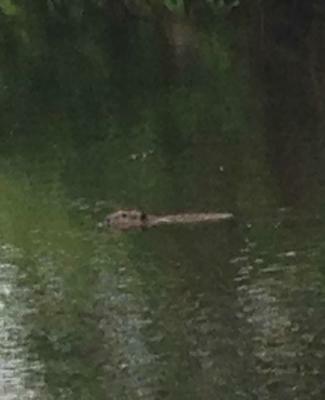 On my first trip about sunrise I spotted this beaver cruising around.